Legacy of Light has a spark of its own. It’s the kind of play that whisks you back and forth between centuries without pausing to let you question all the time travel. It’s the kind of play that can be poignant as all get-out and, every once in a while, heart-stoppingly funny. It’s the kind of play that may make you question whether science can explain the human connections that defy common sense. As directed by Denise Gillman, Legacy of Light is also pretty close to a perfect summer treat – if you like your summer treats to be both sweet and substantial enough to carry with you out into the night. Of course, maybe to you a summer comedy doesn’t begin with Voltaire, the bewigged 18th-century philosopher and author, who was as famous in his own time as he has been ever since. Give the guy a break. In Legacy of Light, Voltaire (the slyly entertaining Steven Lane) possesses the kind of wit to write home about, and he’s so full of himself that you have to sit back and enjoy the constant show. Voltaire has long been emotionally involved with Émilie du Châtelet (the radiant Heather Charles), but he’s peeved that her mathematics are better than his – and she’s looking beyond the famous philosopher to all the pastimes, mental and physical, that can make the most of her life. Cut to Olivia (Becky Eck) and Peter (Stephen Lima), a couple of 21st-century New Jerseyans. She’s a scientist and he’s an elementary-school teacher, and they’re eager to have a baby even though Olivia can’t get pregnant. When they meet Millie (the bright-eyed and appealing Lexi Langs), something between them clicks, and before you know it she’s carrying their baby and all three of them are peering into the great unknown. Eck and Lima are just as quirky as they ought to be: There’s a niceness about their two characters that makes you wish them the best. But playwright Zacarias never makes them dull: Their song, you have to understand, is Thomas Dolby’s “She Blinded Me With Science.” And, just to be difficult, Zacarias has provided a couple of characters who get in the way of everybody else – notably the puppy-eyed Saint Lambert (Garrett Jurss), Émilie’s current squeeze, and Lewis (Jurss again), Millie’s stubborn brother, who looks as steadfastly backward as she does ahead. Grayson Tate has provided everyone, both present and past, with faultless costumes, and William Elliott has created a suitably handsome abstract set. Unfortunately a couple of pieces of furniture have to be moved between each of the many scenes, and the production slows down every time that happens. But the scenery also includes some remarkable photos of the cosmos, a source of fascination both for Émilie and for Olivia, her modern-day counterpart. And it’s the unknowable in those photographs – is Olivia’s newly discovered planet really forming, or will it turn out in a million years to have been nothing at all? – that captures the women characters and sets them apart. Voltaire, after all, is caught up in Sir Isaac Newton’s ideas of the rational world: Everything, he says, is cause and effect. But the women who surround him, and those who follow, are more interested in the unknown and even the unknowable – in the “dark matter” all around us, in the energy that transforms the world and that, in Zacarias’s view, passes from one woman to the next. It’s a view of life that Millie would call “amazingly amazing.” If you’re open to be charmed, you may be amazed as well. What: Mad Cow Theatre production of Karen Zacarias comedy. When: (corrected time): 7:30 p.m. Thursdays-Saturdays, 2:30 p.m. Sundays, through Aug. 28 (also, 7:30 p.m. Aug. 8 and 22). Cost: $27 general, $25 seniors and students, $15 Mondays. 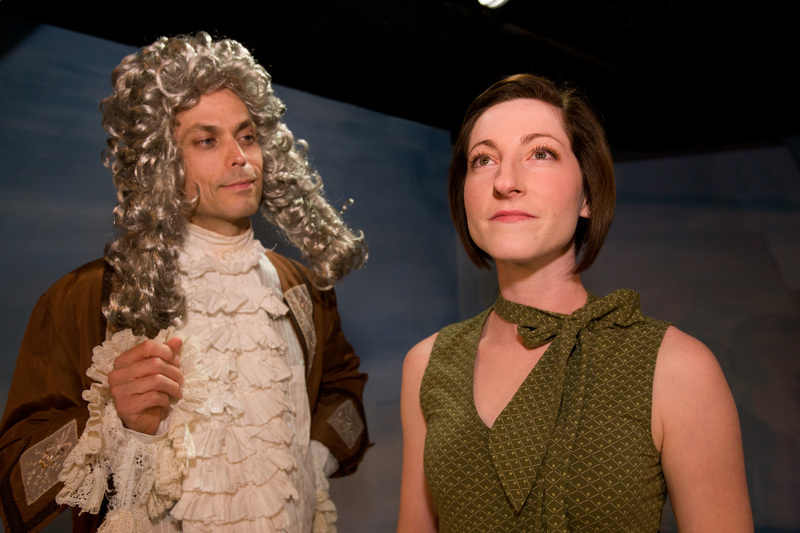 This entry was posted in Orlando theater, Regional theater, Reviews and tagged Émilie du Châtelet, Isaac Newton, mad cow theatre, Orlando Florida, Theatre, Voltaire. Bookmark the permalink. I MUST see this play. “Legacy of Light” is fantastic. It kept our attention completely and was a delightful story and made you think. The actors were so professional and a the casting was great. We left talking about the play and just got so much enjoyment out of it. Not your run -of- the- mill play, a thinker and very entertaining. Jamie Lyn, thanks for the correction. I don’t know how I got the times of Legacy of Light wrong – I know them by heart. Guess my by-heart factor wasn’t working too well last weekend. I’m glad you caught it! What other productions has Stephen lane been in?